Drug compounding made the wrong kind of headlines in October 2012 when U.S. health officials announced that patients injected with products prepared by the New England Compounding Center (NECC) were contracting and dying from fungal meningitis. The full impact of contaminated compounded medications on lives, dollars, and the professional reputation of pharmacy practitioners may not be known for years. What quickly became apparent in the U.S. Food and Drug Administration and state pharmacy board investigations, however, was that NECC personnel were not complying with laws regulating pharmacy compounding, nor adhering to best practices for ensuring drug compound quality and sterility and NECC was not accredited. Following an event such as this, prescribers and patients could understandably harbor misgivings about all compounding pharmacies. Assuaging those concerns requires pharmacists, student pharmacists, and pharmacy technicians to hold themselves to the highest standards for compounding. An excellent way to show the world you and your colleagues are doing so is to earn drug compounding accreditation. 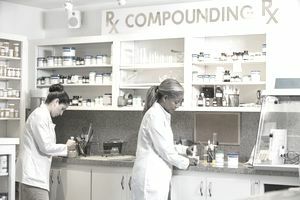 Pharmacy Compounding Accreditation Board (PCAB) accreditation indicates that staff involved in compounding have proper and ongoing training in preparing customized dosages; that the pharmacy uses high-quality APIs and inactive materials; and that all compounding procedures are fully documented and carried out in conformance with established formulas. PCAB accredits sterile and nonsterile drug compounding practices but does not vouch for nuclear pharmacy practices or pharmacies outside the United States. Significantly, Veterans Affairs medical centers can contract only with PCAB-accredited pharmacies. A PCAB-accredited pharmacy, according to the board, must demonstrate that "all personnel affiliated with compounding… are competent to perform their assigned duties." This applies to supervising pharmacists, staff pharmacists, student pharmacists assigned compounding duties and pharmacy technicians. Demonstrating competencies requires showing that staff members hold all relevant licenses, certifications, credentials, and registrations. As of Jan. 1, 2015, all compounding technicians at accredited pharmacies must be certified. Pharmacy personnel need to document compliance with USP 795 nonsterile compounding and USP 797 sterile compounding standards. This means recording standard operating procedures on paper or in computers and keeping records that permit matching dosages with individual patients. The pharmacy must also have logs of how and when the stock is rotated, equipment is cleaned and calibrated, and materials are tested for quality and purity. Pharmacies seeking PCAB accreditation also need to prove they only compound with active pharmaceutical ingredients (APIs) and other materials that meet USP and National Formulary standards, list all APIs on product labels and maintain certificates of analysis and materials safety data sheets for each substance they use. A significant requirement for full USP 797 compliance and PCAB accreditation is that pharmacies compounding drugs that pose high risks to patients' health if they become contaminated must have cleanrooms that meet ISO-8 standards. PCAB emphasizes that using more-typical equipment like compounding aseptic isolators is not always sufficient to ensure sterility. PCAB accreditation depends primarily on the results of on-site inspections during which reviewers confirm personnel qualifications, check equipment and facilities, and ensure the accuracy of records and documents. Pharmacies applying for initial accreditation or reaccreditation pay the full cost of each inspection. Pharmacies also pay a one-time application fee and annual fees based on compounding volume. What is the Role of a Immunization Pharmacist?